Beijing's temple fairs, which originated during the Liao Dynasty (916-1125 AD), are a part of celebrating the arrival of spring, and so, have evolved into part of the Chinese Lunar New Year festivities. They have been exciting for about 1,000 years. There are three types of temple fairs, monthly temple fairs, temporary temple fairs and temple fairs for different professions/industries. 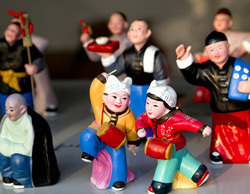 To the old customs, Temple Fair is the most important activity during the Spring Festival. In Beijing, it has a time-honored history. Traditionally, there are various kinds of performances in temple. Besides, one can find traditional arts and handicrafts as well as countless tasty local smacks from craftsmen and vendors along the streets. 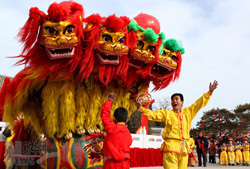 Most temple fairs are features by their dragon and lion dancing as well as folk performances. For foreign visitors, it is a rare opportunity to experience Chinese colorful culture and tradition. If you've never visited temple fairs of Beijing, then you must experience this style carnival with the locals and feel the bustle and lively New Year atmosphere of Beijing. 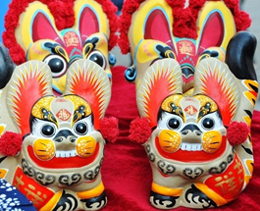 Longtan Temple Fair (lóng tán miào huì 龙潭庙会) will enter its 31st year since it was first held in 1983. 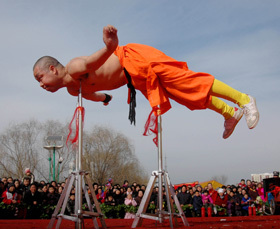 This fair is renowned in Beijing for its common and fitness activities. It highlights various folk performances and folk arts. It is also the best choice for sampling a variety of local snacks sold by vendors, such as Chaogan (stir-fried liver), Baodu, Lvdagun and Yangzasui. You can find a street full of time-honored Beijing traditional snack shops, and Tianjing specialties. Buses: Take 34, 35, 36, 743, 957, 943, 822, 705 or 41 to Guangminglou, or 6, 8, 607, 60, 958, 116, 750, 12, 352 or 807 to Beijing Amusement Park. Features: The temple fair, which originated in 1984, will feature a 300-strong parade this year. A stage will be set up for Taekwondo and other martial arts champions to showcase their skills. A photo exhibition will also be held to review the temple fair's history. Don't miss the exhibition of blue-and-white porcelain from Jingdezhen, the "ceramic capital" of China. Visitors will have a chance to compete with the Chinese chess masters. 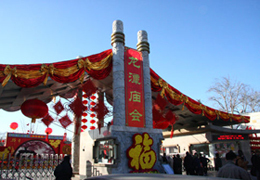 The Changdian Temple Fair (chǎng diàn miào huì 厂甸庙会) is Beijing's oldest and best known temple fair. Changdian temple fair has everything you'd expect of a temple fair, a mixture of the tradition and modernity. There are plenty of goods to tempt you: vendors selling paintings, calligraphic works, antiques, children's toys, crafts and local snacks. Performances including martial arts, acrobatics, Peking Opera, talk shows and folk dancing always keep the crowds entertaining throughout the day. Changdian temple fair is the best place to go to learn about northern folk customs that represented by Beijing and is one of the temple fair sites particularly enjoyed by foreigners. How to get there: take bus No. 5, 6, 7, 14, 15, 23, 66, 102, and 105 to Hufangqiao or take subway (Line 2) to Hepingmen station. 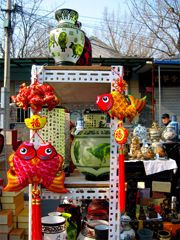 Ditan Park Fair (dì tán miào huì 地坛庙会) is one of the busiest temple fairs in Beijing. It has an altar where sacrifices were formerly offered to the earth god. Activities and events during the fair include a packed entertainment scheduled with a variety of performances and hundreds of stalls and booths selling local snacks, handicrafts, antiques and curios. Bus: Take 13, 116, 62, 44, 800, 606, 684 or Te 2 to the South Gate of the temple, 27, 358, 119, 407, 328, 803 or 18 to the West Gate of the park, or 125 or 117 to the East Gate of the temple. Features: Known as one of Beijing's busiest and biggest temple fairs, the Temple of the Earth is the site of the altar where sacrifices were formerly offered to the earthly god. Activities include colorful folk performances, fashion shows, antiques, handicrafts and a food street. 200 excellent performances will be staged this year. Famous Chinese artists are invited to paint and write calligraphy works on the site to showcase the traditional culture. Baiyunguan Temple (bái yún guàn miào huì 白云观庙会) is well known as the oldest and the best preserved Taoism Temple that possesses the largest variety of Taoism heritage throughout China. The temple has long been one of destinations that Beijing locals to visit during Spring Festival to pray for blessing. The Temple Fair is a buzz of traditional folk performances and hundreds of snacks with typical local flavors. In addition, it has Taoist culture exhibitions that attract people who are interested in Taoism. How to get there: Take bus 320, 414 to White Cloud Station or 114, 308, 937 to Baiyun Road. This temple fair (dà guān yuán miào huì 大观园庙会) holds at Grand View Park, a replica of the magnificen Daguanyuan garden of n imperial family described in the well-known Chinese novel “A Dream of Red Mansions” by Qing Dynasty writer Cao Xueqin (17l5-l763). The temple fair is featured in fine cuisine based on the novel, and many time-honored Beijing snacks. Besides, there will be shows of folk arts, Kungfu, "Two-people show" (Er Ren Zhuan) from northeastern China, costumed parades, acrobatics and other ethnic and cultural performances inside and outside the park. How to get there: Take bus No. 19, 49, 59, 61, 122, 351, 410, 414, 716, 816, 819, 922 and 937, get off at Daguanyuan station. Features: Daguanyuan Temple Fair, located in the Chongwen District, is reminiscent of a luxurious garden of Ming and Qing style. In the Chinese classic "Dream of Red Mansions", the garden is recount as the mansion of Jia Family - an official nobility of the Ming period. The garden holds the Red Mansion Temple Fair, where tourists can enjoy culture performances, fork culture performances and traditional snacks. Activities held here feature the Honglou (Red Mansion) culture style. The performances include 'The Imperial Concubine Yuan Visiting Home" and "Wedding of Jia Baoyu and Lin Daiyue", which have been highly acclaimed by many tourists interested in the glittering culture of ancient China. Royal cuisine and delicate snacks are also available. Founded during the Yuan Dynasty, Dongyue Temple is a Daoist (Taoist) temple, dedicated to the God of Mount Tai, knows as Dongyue - the easternmost and holiest of the five sacred mountains of Taoism. 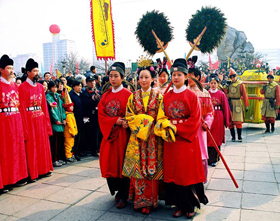 The temple fair (dōng yuè miào miào huì 东岳庙庙会 ) is one of the oldest temple fairs in Beijing, tracing back to Yuan Dynasty. The culture of “Fu” (Good Fortune) has been the essence of this temple fair for centuries.There are folk-custom shows and other activities such as a Taoist music performance, exhibitions and sports competition. It also boasts a huge number of food stalls selling tasty local snacks. How to get there: Take bus No.101, 109, 110, 112, 750, 846 or 813 to Shenlu Jie or take subway line 2 and get off at Chaoyangmen station. Chaoyang Temple Fair (cháo yáng gōng yuán miào huì 朝阳公园庙会) is designated as Chaoyang International Carnival and is held in Chaoyang Park.It features performances by renowned bands from abroad. People can also go skiing; play games, and enjoy the food from foreign countries. How to get there: Take bus No.31, 302, 705, 731, 750, 752 or 852 to Chaoyang Park; or take subway Line 10 and get off at Tuanjiehu station. 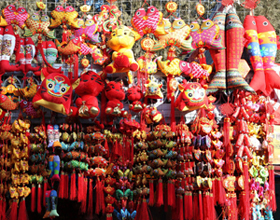 Shijingshan Temple fair (shí jǐng shān miào huì 石景山庙会) is a foreign-style temple fair. It is almost like a foreign carnival parade. 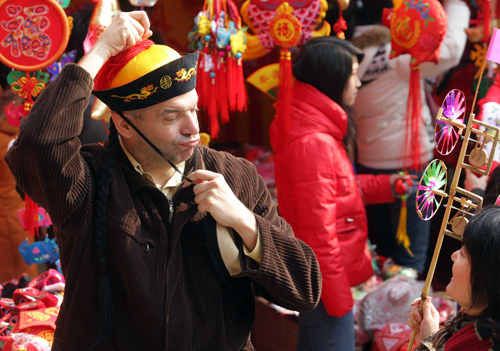 Shijingshan Temple Fair is full of foreign scenes, exotic performances, ice and snow parties. There will also be other amusement programs especially for kids. Located close to Beijing West Railway Station, the Lotus Pond (Lianhuachi) Park is regarded as the birthplace of the city of Beijing, bearing a history of over 3,000 years. The temple fair (lián huā chí miào huì 莲花池庙会) here is quite traditional, with more than 100 events going on to make the park an ideal place to enjoy Chinese folk arts and food. Lianhuachi Temple Fair features a special landscape of Huaguo Mountain and Shuilian Cave, the residence of the Monkey King in Journey to the West.Other song and dance performances, such as yangge and duets of northeast China will be performed, and Shifuxian, or poem-string, an over 200-year-old folk art on the verge of extinction will make its debut at the fair. Buses: Take 323, 324, 300, 368, 57, 1, 4, 964, 321 or 339 to Liuliqiao Beili or Te 7, 309, 719, 620, 704, 122, 38, 927, 410, 715, 390, 917, 340, 6 or 50 to Liuliqiao or Lianhuachi. Features: Lianhuachi (Lotus Pond) Park Temple Fair is rather traditional, with more than 100 activities staged for people to enjoy the traditional folk arts and snacks. Singing, dancing, local operas, acrobatics and a flower fair will catch your eye. In the Qing dynasty, this old summer palace was once among the most bustling places in China during Spring Festival. This year, Beijing is attempting to reproduce something of the atmosphere and experience of an im¬perial-era royal temple fair (yuán míng yuán miào huì 圆明园庙会) at the same venue they used 200 years ago. The temple fair will feature showcases of the Qing emperors’ customs, cuisine, leisure and academic activities, and more. Buses: Take 365, 432, 498, 656, 664, 717, 743, 814, 982, 963, Te 4, Yuntong 105 or Yuntong 205 to the East Gate of the park, or 319, 320, 331, 432, 438, 498, 628, 690, 697, 696, 801, 826 or Te 6 to the South Gate of the park. Features: This temple fair is well-known for its strong "imperial" flavor. Activities include skating and football on ice, as well as wrestling, a lantern exhibition, folk fair and operas. The ice shows, which date back to the Qing Dynasty (1644-1911), will be re-staged here, with professionals invited to perform acrobatics and figure skating on the ice to help visitors experience the grand scenes and customs of the royal family during the Spring Festival. Housing the Beijing Folk Customs Museum, this temple (originally built in 1319) is host to one of Beijing’s most traditional Spring Festival fairs. 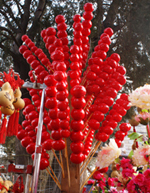 The most recent version of its temple fair (dōng yuè miào huì 东岳庙会) kicked off in 1999. Themed this year ‘Soaring Golden Dragon’, like any good old fair it will feature drum troops, Chinese opera, acrobatics and cross-talk shows will provide plenty of noise and entertainment. The fair will also feature an exhibition of antique Chinese boxes. Not necessarily one for thrill-seekers out there, this should be pretty fascinating with genuine pieces. Highlight: Exhibition of "Fu (福, Good Fortune)" culture. Details: Dongyue Temple Fair had started as early as the Yuan Dynasty (1206 – 1368). The culture of "Fu" has been the essence of this fair. Many activities are centered on the "Fu" culture. 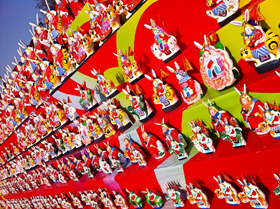 Visitors can pray for food fortune at the altar, walk on the "Fu" road, or hang a "Fu" card to invite Fu" for the coming year. Colorful folk performances, artwork displays, and snacks are also available.